March 30, 2013 – Links International Journal of Socialist Renewal -- Two leading voices against France’s military intervention in Mali, Paul Martial and Bertold du Ryon, have written a comprehensive dossier on the subject. It is published in the weekly print and web bulletin of the New Anticapitalist Party (NPA) in France, Tout est à nous, dated March 14, 2013 (#186). The dossier is a valuable overview of the situation in Mali and stands out for its unyielding opposition to the intervention. That’s no small feat in a France that is awash in national patriotism and anti-Islamic prejudice over the issue. 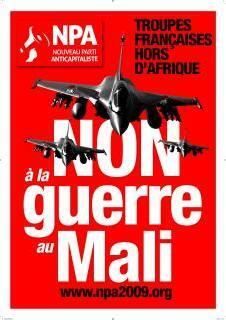 "The military attack in Mali has been condemned by groups on the political left in France, including the Nouveau parti anticapitaliste (New Anti-Capitalist Party [its newspaper pictured above]) and the Gauche anticapitaliste (Anti-Capitalist Left). The latter is a tendency within the Front de gauche (Left Front). Shockingly, the Left Front leadership group has come out in favour of the intervention." January 18, 2013 – Links International Journal of Socialist Renewal/Green Left Weekly -- France, the former slave power of west Africa, has poured into Mali with a vengeance in a military attack launched on January 11. French warplanes are bombing towns and cities across the vast swath of northern Mali, a territory measuring some one thousand kilometres from south to north and east to west. French soldiers in armoured columns have launched a ground offensive, beginning with towns in the south of the northern territory, some 300 kilometres north and east of the Malian capital of Bamako. 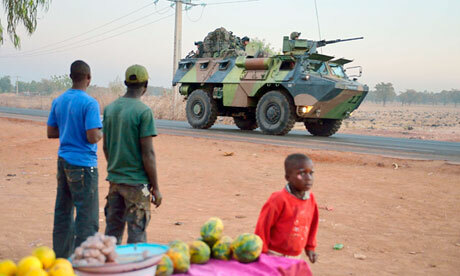 A French armoured convoy entered Mali several days ago from neighbouring Ivory Coast, another former French colony. French troops spearheaded the overthrow of that country’s government in 2011.